← Question Time – Democracy Lite? This song was written by Thomas Davis, one of the founders in 1842 of the nationalist periodical, `The Nation` and appeared in his paper alongside similar verse described by Robert Kee in `The Green Flag` as “trite but often of stirring quality”. In this programme he explains the song served as the unofficial national anthem of Ireland. While pointing out the melody depicts an unrealistic version of nationhood which is also inconsistent with what the nation of Ireland had been and what it became. Further, how he asks could Ireland become `A Nation Once Again`, when a significant minority oppose the very idea? Commentators seeking to analyse Irish Nationalism dispassionately, such as Robert Kee, can find themselves subject to criticism based on the unfounded notion that they are taking sides – a problem familiar to all historians. But the issue is more potent when it concerns Irish History/Nationalism. The resurgence of interest in Robert Kee following his death has lead to a rise in viewers to his television history on Youtube. Some of the comments give a flavour of the problem, as Kee is criticised on the one hand for producing an overly sympathetic portrayal of the Irish, while on the other hand criticised for being hostile to the Irish. Both assertions are ridiculous, the programme rightly received wide-spread acclaim when broadcast. Kee`s `The Green Flag` contains an inscription, from AG Richey,”to appreciate the history of this or any other country it is necessary to sympathise with all of the parties”. Kee`s television history achieves this but his sympathy does not inhibit him from looking at Irish nationalism with a critical analytical eye. His inquisitorial approach allows for a balanced appraisal, while outlining the adversarial history of this most distressful country and the part played by Britain. The programme begins with Kee suggesting that to unravel Ireland`s past, it is necessary to start in Britain, most notably the Palace of Westminster. Because London he explains has laid claim to Ireland for over 800 years. Although it would be “oversimplifying things to say that is the cause of the Irish problem – certainly it is the cause of Britain`s Irish problem because the attempt to assert that claim has given Britain its most persistent problem in its long domestic history.” Kee provides telling early comments from Queen Elizabeth I, William Pitt the Younger, Robert Peel and William Gladstone. All are critical, viewing Ireland as troublesome and violent. Kee then contrasts the Clerkenwell bombing by the nineteenth-century Fenians (an attack which prompted Gladstone in his attempt to pacify Ireland), with the equally cruel and horrific Birmingham bombings in the 1970s. The Clerkenwell bombing we discover was the last public execution in Britain, executions continued however, over one-hundred Irishmen executed during Kee`s lifetime. He cites further examples, illustrating the correlation between violence and alterations in British policy. He also points out that in 1900 Queen Victoria visited Ireland and was granted a rapturous reception from the Irish masses, although vilified as the `Famine Queen` by Republicans. Kee informs us there was hardly a Republican voice to be heard at this time thanks to a range of government reforms, and so an equally warm reception was granted again to King Edward VII. Within a few years the Easter Rising (1916) occurred, which changed everything utterly and to borrow a phrase, a terrible beauty was born. How this transition took place is outlined, the first episode concentrating on discovering who the Irish are. We learn that they are a mixture of early settlers and invaders, who in time gradually assimilate – a process described with common frequency. Kee points out that the early Neolithic agricultural societies were made up of people who arrived in Ireland from the Iberian Peninsula via Brittany thousands of years ago. Other settlers (it is not stated but he is referring to the Celts) migrated from Britain (Scotland) whose proximity to Ireland played a crucial role. But these very early societies according to Kee provide us with something separate and distinguishable from Britain and something identifiably Irish. 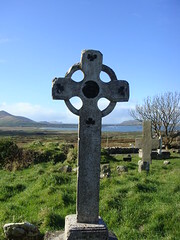 The Christianization of Gaelic Ireland we are told was a fusion of Gaelic traditions and Christianity. This alongside the invasions by the Vikings and the Normans is graphically outlined. The role of Strongbow is identified leading to London`s intervention through Henry II. This meant the subjugation of Ireland a process that “took place almost without realising it.” The Normans and the `Old English`(of ancient Norman stock) became more “Irish than the Irish.” The Kings government concentrated around an area of Dublin that became known as the Pale. We discover that Ireland missed the Reformation due to geographical factors and because of the Irish language, there was no Protestant prayer book written in Irish. The role of Elizabeth I is pivotal and described by Kee in grim detail, her armies viewing Ireland in the same way the Spanish Conquistadors thought of the Indians in America. Kee stressed throughout the initial broadcast that the Irish are a mixture of many different ethnic/national groups, quintessential Irish names such as Bourke, Fitzpatrick and Joyce are Norman. Diverse strands have contributed to forming `the Irish`Kee writes in his publication `The Green Flag` “the Irish were a too complicated and subtle amalgam of conquered and conquerors for historical racialism to be of much value in explaining events” when considering Irish Nationalism this is an important point to keep in mind.